The shadow of UEFA's Financial Fair Play Regulations ("FFPR") continues to fall over European football. Whilst most commentators see the FFPR as being designed primarily to clip the wings of the sugar daddy financed Manchester City or Chelsea, the last few days has seen their practical impact on a club that should require no external financing; FC Barcelona. On Saturday, new President Sandro Rosell and CEO Rossich Anthony not only persuaded Barca members to vote for court action against former President Joan Laporta but presented a budget for the current 2010/11 financial year which imposes breathtaking cuts on the formerly spendthrift club. In some ways, the plans for 2010/11 contain the usual Barca swagger. Matchday and media income is projected to increase slightly implying progression to semi-finals of the Champions League for what be the fourth year in a row. What has gone however is the enormous spending of the Laporta era. Sporting salaries (84% of which relate to football according to the most recent accounts) are projected to fall 6.2% having risen 17% last season. Player amortisation (the cost of transfer spending recognised over the contract life of acquire players) is projected to fall 17% and other costs are supposed to fall a George Osborne like 24%! Bringing costs back in line with income is of course just good practice, and Barca's need for an emergency credit line in the summer told us all we need to know about how overstretched the club had become. After all, Laporta's regime oversaw the ludicrous saga of Zlatan Ibrahimovic's transfers which the club claim cost €33.4m including no less than €8m to his agent, the lucky Mino Raiola. On my calculations, FC Barcelona would have missed UEFA's "break-even" target by a staggering €48.5m if the rules had been in place last season. The "Acceptable Deviation" UEFA say they will permit each year is only €5m and of course Barcelona do not have a Sheikh Mansour to fill some of the gap. The Rosell plan, shows the club squeaking in this year with a c. €10m surplus putting the club on a firmer footing for the first "monitoring period" for the new regulations, the 2011/12 season. Plans are of course plans and football is inherently unpredictable. Rosell and his board know all this of course which is why I think we can probably rule out the Catalans in any future bidding war for W Rooney esq. The new UEFA regulations can be downloaded here. Too often football supporters in England believe they are powerless against the financial exploitation of our game and our clubs. Ticket sales are weak, the waiting list is gone, Gill et al fear more supporters making the tough decision to abandon their season tickets in the future. We know from sources inside the club that during the height of the green and gold campaign the hierachy were extremely worried about damage to the "brand" in the eyes of potential sponsors (note, not the club, the "brand"). "UNITED AGAINST GLAZER - MARCH TO OLD TRAFFORD"
"There are only two sides to this fight"
Apologies in advance for the slightly technical nature of this post. It is an analysis of the cash flow dynamics in United's business. It is not trying to make a political point, rather to help those without a financial background get their heads around what is happening and what the outlook is for the next few years. Please email me if you require any clarification on the more technical aspects and I'll endeavour to reply. The club had a lot of debt (£522m) and a lot of cash in the bank (£164m) at the 30th June. The source of the debt is obvious, the original takeover and the subsequent refinancings in 2006 and most recently in January 2010 when the "Senior Secured Notes" (aka "bonds") were issued. The cash in the bank has come from several sources which I describe below. The reason all this is important (even if it is quite technical) is because not all the cash reported is "available", some of it will be needed to pay costs during the season when less cash flows in. In addition, the Glazers have large and growing "entitlements" to take dividends out of the club. They have not done so as yet, but supporters should be aware what impact taking up these rights would have on the bank balance. Finally, most agree the ageing squad will need investment in the coming years, probably more than the £31m spent in the 2009/10 season. By understanding the cash dynamics, people can reach their own conclusions about whether high investment and dividend payments are compatible. Where has this £163m come from? The "seasonal" effect and the need for a "buffer"
Football clubs receive a lot of money in the summer from season tickets and seasonal hospitality sales but "recognise" this income in the profit and loss account as games are played. In addition, a high proportion of TV money is paid at the end of the season. At the 30th June, the amount received from season ticket and executive sales for the 2010/11 season was £52m (interestingly £2m lower than the previous year). Clubs' costs are incurred more evenly over the year (over 70% of costs are wages). This means that there is a substantial seasonal difference between when cash is received (mainly in the April to June quarter) and when profits are recognised (more evenly but with the October to December quarter with the most home games being the most important). 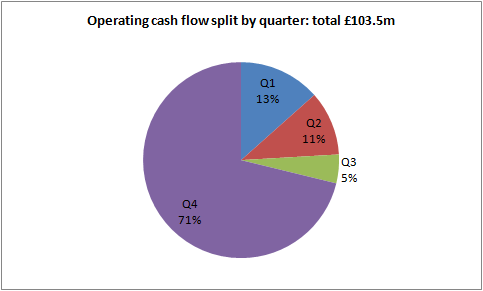 With the results just published, we can see for the first time how these seasonal effects impact on cash flow over each quarter of the financial year (the club has only had to report quarterly since the bond issue). 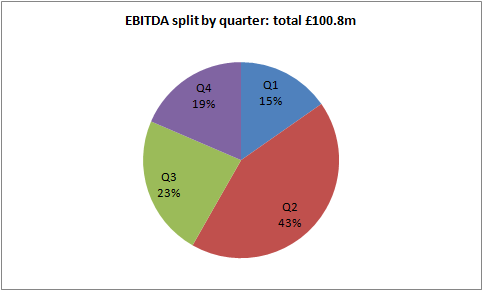 The seasonality can be seen in the pie charts below which compare how EBITDA is split and how operating cash flow (EBITDA + changes in working capital) is split. The difference is very, very pronounced, with over 70% of cash (remember this is before transfers, interest and spending on the stadium) coming in the final three months of the year, three months that only generate 19% of the year's operating profit. This seasonality explains why United have a history of holding substantial cash balances at the end of each season and has occasionally had to use its "Revolving Credit Facility" ("RCF"), a sort of overdraft facility. Since the bond issue in January, the club's current RCF is £75m which is available to cover short-term cash requirements. The bond prospectus gives some details about the RCF, including that it costs c. 3-4.5% above LIBOR (currently around 1%). More importantly, the RCF has a five day "clean down" to £25m each year. This means the club has to reduce the drawn balance of the facility to a maximum of £25m for at least five days a year. This is to ensure the facility is used for short term borrowing, not long term investment. The table below shows the season end cash balance over the last few years (and also what percentage of turnover that represented at the time). 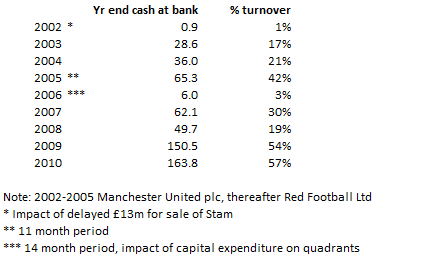 As the table shows, large cash balances are the norm for United (except when there is a one off hit to cash such as Lazio failing to pay for Stam in 2002 or the building work on the quadrants in 2006). 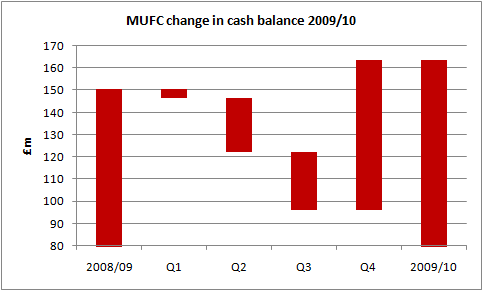 From 2003 to 2009 (and excluding the quadrant impacted 2006), United had balances averaging £48m at its year end. So what changed in 2009 and 2010? Cash Boost No.1 The Aon and other commercial upfront payments. United negotiated a strange but useful pre-payment when it did the sponsorship deal with Aon in June 2009. Aon agreed to pay £35.9m (45%) of the £80m four year deal upfront and a year before the sponsorship started. This boosted the 2008/09 and 2009/10 cash balances, indeed it represents 24% of the 2008/09 closing balance and 22% of the 2009/10 balance. Such prepayments along with season ticket money received for the following season are called "deferred income" in the accounts. Deferred income from commercial contracts totalled £65.7m at 30th June 2010, up £8.2m on the previous year. So United is sitting on £65.7m of cash from various sponsors and partners for sponsorship that has yet to happen. That represents 40% of the club's cash balance at 30th June 2010. This cash is great for the club of course, but as time goes on, will have the effect of reducing the club's cash flow compared to its profits. 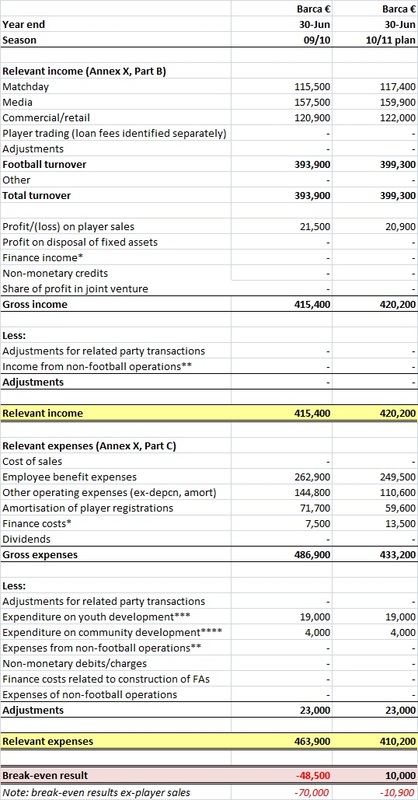 In each of the next four years, the club will book c. £20m of Aon related revenue (and profits as the costs of being sponsored are virtually zero) but will only receive £11m in cash (the other 45% having already been paid). On the Aon contract alone therefore, operating cash flow will be c. £9m a year lower than operating profit each year. Add in the other £29.8m of commercial deferred income and the hit to cash flow could be even greater (although we do not know any details of the other commercial prepayments). The existence and potential use of "the Ronaldo money" has been a hot topic ever since he his sale to Real Madrid was announced on 11th June 2009. The £80m received by United days before the end of the 2008/09 financial year represented 53% of that year's closing financial balance. Since that date, the club has spent £44m in cash on players (both new and ongoing payments for players already signed) and received £14m for selling players; a net spend of £31.8m. I think we can safely say therefore that "the Ronaldo money" is still there. It represents 49% of the club's current cash balance. Interest on the old bank debt used to be paid quarterly. Interest on the bonds is paid twice a year on 1st February and the 1st August, with the first payment on 1st August 2010. The cash flow statement for the period January to June 2010 therefore includes virtually no interest actually being paid (the interest is charged to the profit and loss account of course). The £15.2m of "interest" in the cash flow statement actually refers to a £12.7m payment on the swap closure and interest on the "Alderley Mortgage" taken out to buy the freight terminal next to Old Trafford. In future years around £45m (depending on exchange rates) will be paid out in cash each year and another c. £5m for swap costs. So in the 30th June 2010 cash balance is a one-off interest rate holiday of c. £10m (c. £22m bond interest which would "normally" be paid in the second half of the year minus the large swap cost). Movements in cash flow can be divided into a series of categories, some of which are described above. Of primary importance of course are the cash profits (EBITDA) a business makes. I am going to deliberately leave the outlook for profits for another day, and focus on the other dynamics at work further down the cash flow statement. 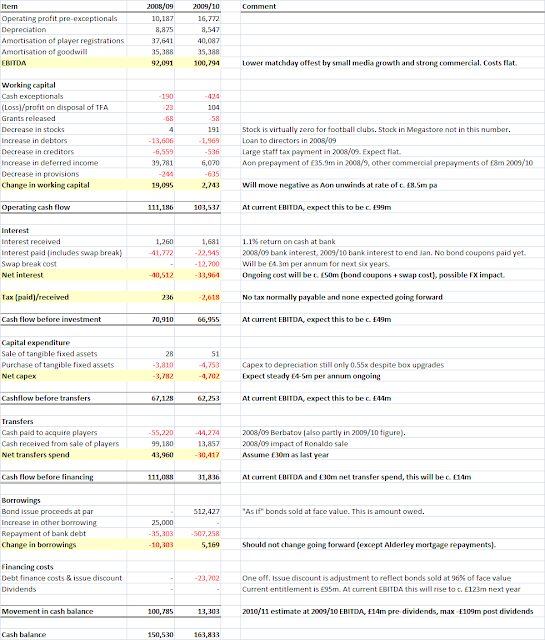 The following table shows the actual cash movements in some detail in 2008/09 and 2009/10 and my comments on the outlook (assuming flat EBITDA). United is a great business, and as the table above shows, if profits just remain flat, will still generate around £14m of cash next year (assuming a net £30m is spent on transfers). That £14m is before dividends, and in 2009/10 of course the Glazers did not take any of the £95m in dividends to which they were entitled. Assuming flat profits, by the end of the financial year 2010/11 the dividend entitlement will have grown by another £28m. In total the entitlement will be £123m. Obviously if all this was paid, the net cash flow in the model above would be a £109m outflow not a £14m inflow. This would take the cash balance at the club down to around £55m, totally swallowing up the one-off benefits of the Aon prepayment and the Ronaldo money. The club's cash balance would be back to where it has been in previous years, the amount needed to cover seasonal fluctuations. 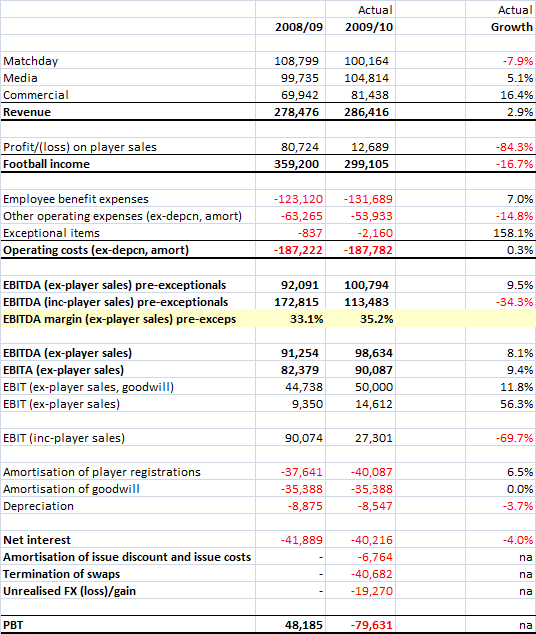 If that wasn't enough, the ongoing dividend entitlement (roughly 50% of EBITDA minus interest) would make the club cash negative at current profitability. Of course the vast majority of supporters don't spend a moment thinking about the year-end cash position of the club, but do spend time wondering what investment will be needed to keep our squad competitive in future years as Giggs, Scholes, Neville, Van de Sar, potentially Ferdinand and probably Hargreaves bow out. 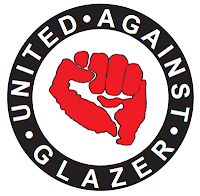 Will the Glazers take the £95m (soon to rise to c. £123m) in dividends they are "entitled to"? Will there be enough be in the kitty to adequately replace our ageing squad in the year or two ahead? Revenue up 2.9% year on year, compares to 10.2% pa achieved 2000-2009. 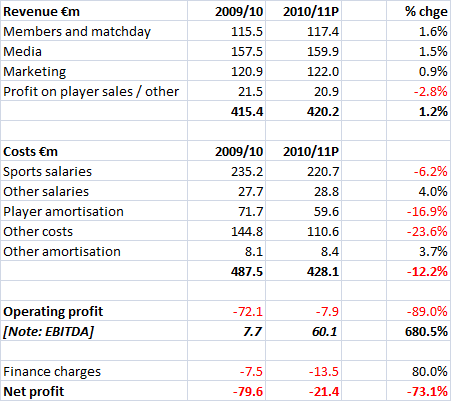 Lower growth down to "poor" season vs. 2008/09 impacting matchday and TV income. Media is boosted by the start of the new three year CL deal. Commercial growth remains strong. Costs control at United has been very good. Like all clubs, wages continue to rise sharply (up 7% despite lower player bonuses) but other costs are down 15% leaving total costs flat. 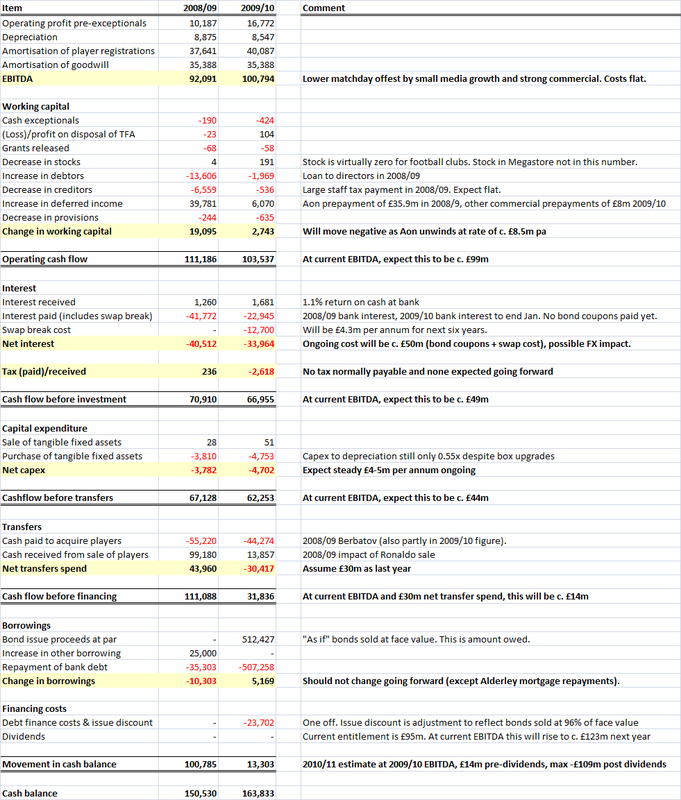 Much of this is due to fewer home games than last year and lower travel costs (not flying to a CL final sadly) and there is also an impact from lower expenses relating to various commercial contracts (these are not detailed or quantified and look to be a one-off). With costs flat and revenue up 3%, EBITDA (pre-exceptionals) was up 9.5% to £100.8m. As ever United is a very well managed football club. Below the EBITDA line we are back in horrible world of Glazernomics. The £35.4m goodwill amortisation charge should be ignored, it's an non-cash accounting charge caused by the 2005 takeover and isn't a real cost. The interest bill of £40.2m includes seven months of bank interest and five months of bond interest. It will be closer to £45m in the coming year. The "amortisation of issue discount" of £6.7m reflects the fact that the bonds were issued at c. 2% discount to their face value (of £100 or $100) but must be repaid at that face value. The difference is accounted for every year to 2017, but the cost won't actually be incurred until they are repaid in 2017. The big "nasty" in these number is of course the cost of terminating the swaps (which we learned about at the third quarter results). These swaps are derivative contracts taken out to hedge the interest paid on the old bank debt. The club fixed at a high rate in 2007 and by the end of 2009 when it came to unwind the contracts was sitting on a £40m loss. Although the whole amount is reflected in these accounts, only £14.6m has been paid in cash in 2009/10, the balance will be paid over the next six years. These derivatives were only required because of the debt placed on the club in 2005. This is £40m of costs incurred for no benefit to the football club at all. The final interest related cost is the unrealised foreign exchange loss of £19.2m. This is another non-cash item reflecting the fact that at today's exchange rate, the cost of paying back the US dollar denominated bonds would be £19.2m higher than their original (sterling) value. As with the "amortisation of issue discount", this can be ignored. Who knows what the exchange rate will actually be in 2017. No money has been paid out of the club to redeem the PIKs. I have no rational financial explanation for this and nor does anyone else I have spoken to in the market. Without sounding like a poor man's Mystic Meg, I can only reiterate that I can see no other source to repay the PIKs other than United and that £70-95m will be used to do so at some point soon. Net transfer spending (in cash so including ongoing payments for players acquired/sold in previous years) was £30.4m. Actual "additions" in note 11 of the accounts are shown as £25.7m, i.e. players with a value of £25.7m joined the club during the year regardless of the timings of payments. The club reveal that since the 30th June year end, further players have been bought for £8.3m. I can only assume this is Bebe. Thankfully United is not Liverpool off the pitch or on it. This is (operationally as a business) the best run football club in England, it has been for nigh on twenty years. Manchester United are at no risk of going bust. The tragedy for the club is that so much of the profits are wasted in interest, fees and charges. To ensure the club can cover these, ticket prices are far above the level they would need to be if the club was debt free. Net investment in the playing squad is low and the coincidence with the need to service the debt is too great to ignore. 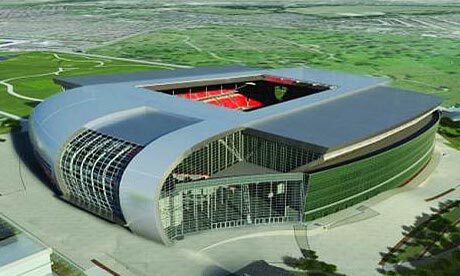 In his Sky Sports News interview, Broughton has just said that NESV would "do the right thing" on getting LFC a 60,000+ stadium but that they hadn't decided whether to build a new one or rebuild Anfield. I find this pretty extraordinary. Is this really a good deal for LFC without this issue agreed? Either NESV can't have a great deal of equity for investment or much confidence of raising debt finance for a new stadium. Time to put that scouse champagne (aka Diamond White) back in the fridge? Where's the money for this coming from? Although the LFC statement talks of the NESV offer "removing the burden of acquisition debt", is the c. £300m offer purely equity financed? If any new debt is being incurred in the purchase, what will this cost compared to the current c. £40m pa interest bill? With the current c. £100m pa wage bill, can LFC comply with the new UEFA Financial Fair Play rules without Champions League football? If not, will one of Gerrard or Torres have to be sold? The club requires around £400m to build its planned new stadium in Stanley Park, how will NESV finance this? Will further borrowing be incurred? Is any debt financing already arranged and on what terms? Part of NESV's success with the Boston Red Sox has been driven by increasing revenue through aggressive ticket price increases at Fenway Park, will the new owners pursue a similar strategy at Anfield/the new stadium? The one thing that is certain is that there is no easy fix for Liverpool's financial troubles.